When will the electric vehicle dream become a reality? Ever since the Government of India made public its intention to electrify all new vehicles by 2030, a sudden wave of excitement has gripped the global automotive industry. Several global and local OEMs in India have begun work on their respective India electric vehicle (EV) strategies. Arthur D. Little has interacted with various stakeholders, such as OEMs, government entities and EV ecosystem players, to understand their perspectives. After having analyzed this insight, we believe 2020 could be the watershed year for the EV revolution in the passenger vehicle (PV) segment in India. Progressive efforts in charging infrastructure and localized battery production could reap dividends, encouraging OEMs to launch EVs for Indian consumers. For India to make the EV dream a reality, it is important that enablers such as the charging infrastructure network, localized battery and product availability move in tandem, given their complementary nature. While the government and the other players in the ecosystem are making the appropriate moves in battery and charging infrastructure, we hope OEMs will also begin to think beyond institutional customers such as government entities and fleet operators, and focus on the needs of retail consumers in order to create sustained momentum and make the EV dream a reality. 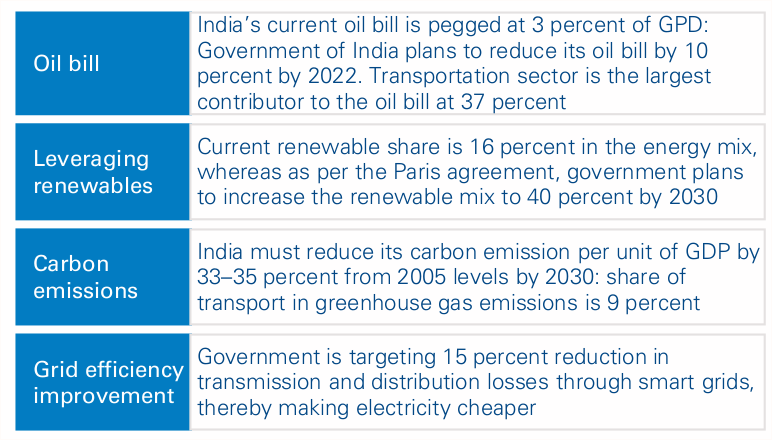 India has embarked on an ambitious plan for going all-electric by 2030. The International Energy Agency (IEA) has estimated that the ambitious target would mean selling 10 million EVs, a figure equivalent to more than five times the number of EVs globally today. While there are key drivers for EVs in India, the goal cannot be achieved without a thriving EV ecosystem such as charging infrastructure and the battery landscape. 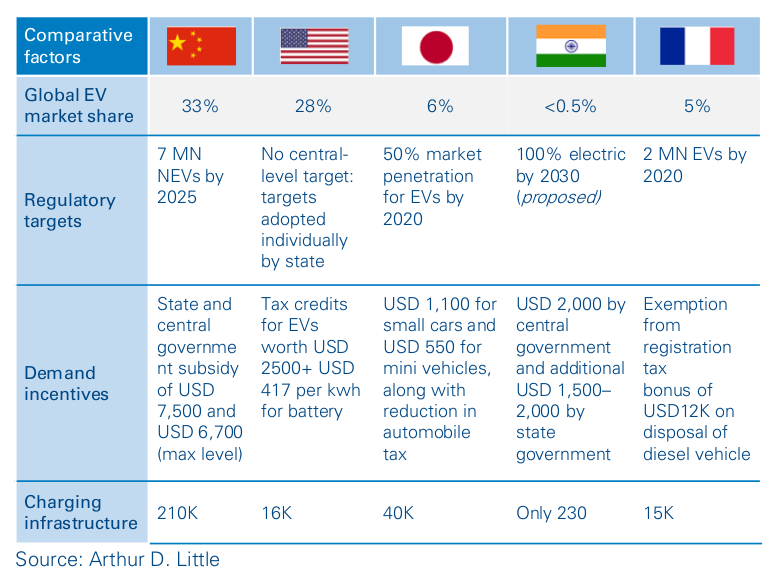 Arthur D. Little has investigated these enabling factors to conclude that the major take-off point for EV revolution in the Indian PV market will be around 2020. From a global perspective, India’s targets are overly ambitious given the current charging density and existing market acceptability for EVs. Charging infrastructure in India is clearly lacking, but even local battery production is a key enabler, as 40–50 percent of an EV’s cost is dependent upon the battery. From the standpoint of government incentives, India needs to take some major steps beyond a mere “subsidy” program. We expect some of these announcements to be made in the short term. As a late entrant to the EV revolution, India has the benefit of hindsight to design a robust policy framework and environment. We expect consensus to be attained across these incentives by the end of 2019. We also expect various state governments to make decisions immediately around dedicated EV car parking, lower or zero registration charges for EVs, and green number plates.